One of the most important reasons to use your credit cards responsibly is to build up your credit score and demonstrate your credit worthiness to lenders. Your credit score is a number between 300 and 900 that tells lenders how risky it is to lend money to you; the higher the score, the lower the risk. 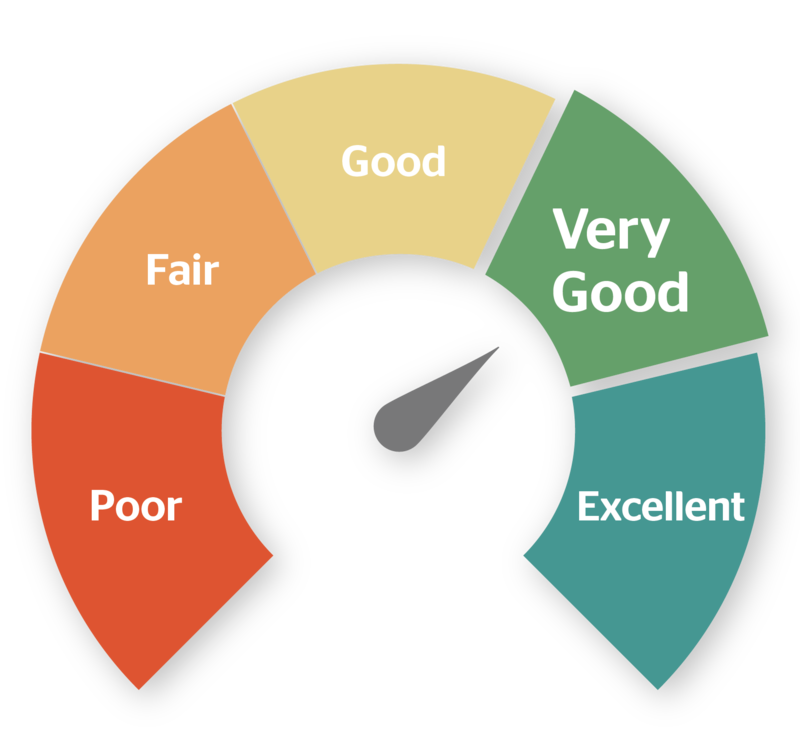 Let’s look at how your score is calculated, what is considered a good credit score, why your score is important and how you can improve it. First of all, “credit” is a financial tool you can use to pay for something without physically having the cash in your wallet – on the promise, of course, that you will repay your creditor (the lender who gave you the credit) at some point in the future. Examples include credit cards, lines of credit, mortgages, student loans, etc. How you use your credit, over time, is ultimately what determines your credit score. The two credit-reporting agencies in Canada – Equifax and TransUnion – don’t reveal exactly how credit scores are calculated, but this pie chart released by FICO1, which is the largest credit-reporting agency in the United States, shows a quick breakdown of how the five factors are weighted. As you can see, making the minimum payment (if not more) on time is the most important thing you can do to build up a good credit score. The balances on all accounts in relation to your total available credit, is the second most important factor to consider. TIP : If you need to carry a balance on your credit card, aim for it to be no more than 35%2 of your total available credit. For example, if you have a $5,000 credit card, try to keep your balance below $1,750 ($5,000 x 35%). The length of time you've been building your credit for is another thing credit-reporting agencies look at when determining your credit score. For example, you'll have a better credit score if you use and pay off one card for five years than a card you've had only for a few months. TIP : Never cancel your oldest credit card. When you cancel any form of credit, the history – including all the payment history – is removed from your credit report and credit score. How much “new” credit – including how many times your credit report has recently been pulled – are indicators that you may be having trouble borrowing money and/or borrowing more than you can afford to repay. Finally, it’s better to have multiple types of credit (e.g. a credit card, loan, mortgage, etc.) versus just one type, because it lets lenders know you are responsible handling multiple forms of credit/debt. All of the information outlined above is eventually turned into a three-digit number: your credit score. As we mentioned above, your credit score is a number between 300 and 900 – and the higher the score, the better. A perfect score is 900, but anything above 750 is considered excellent. You need a minimum score of around 680 to access the best interest rates on any new forms of credit you take out, including mortgages, loans, lines of credit, etc. If your score is below 680, that doesn’t necessarily mean creditors won’t lend you money; it just means you’ll be subject to higher interest rates, as you’ll be seen as a risky borrower – and higher risks come with higher premiums. For example, if your credit score is below 600, you won’t be able to get a mortgage from one of the big banks. Instead, you’ll have to get a bad credit mortgage (which come with much higher interest rates) through a bank, private lender or trust company. When the credit score was first introduced, it was meant to help financial institutions make, “complex, high-volume decisions about creditworthiness”3. Under that reason, it’s always been a piece of the puzzle in determining what interest rate borrowers can get, when applying for mortgages or other loans. Today, however, it can be used in what seems like a dozen other circumstances, including when you’re applying for an apartment rental, an insurance policy and even a new cell phone contract. Some people even have to sign off on future employers running a credit check on them, before they can be hired. Overall, credit scores are meant to prove one thing: how good or “trustworthy” you are with your finances. For this reason, you’ll want to build up and maintain a good credit score for as long as you’ll need access to credit, as the vast majority of people do. First, find out what your credit score is and determine if anything in your credit report is inaccurate. If anything looks wrong, you need to report it to both credit-reporting agencies immediately. Note: Your score is not included in your free credit report, so you will need to pay for it. Don’t apply for multiple credit cards at the same time. All inquiries related to auto or mortgage loans made within the same 2-4 week period are usually combined and treated as a single inquiry, as the credit bureau recognizes it as “shopping around”. However, the same is not true for credit cards. Registering for several new credit cards over a short period can cause your credit score to drop because it signals distress. Selectively apply for only the best new cards available and space out your applications. Pay all of your bills (all forms of credit, as well as utilities, etc.) on time. Even though your regular bills aren’t used to build credit, some cell phone companies may report late payments. Try to pay all of your bills in full, or at least pay the minimum. Never go over the credit limit on your credit cards. Remember: Always try to keep your balance below 35% of the limit. Over time, all of these steps will help you build up your credit history, which will eventually result in a good credit score. FICO - What’s in Your Score?